Cue the noisemakers! Throw the confetti! 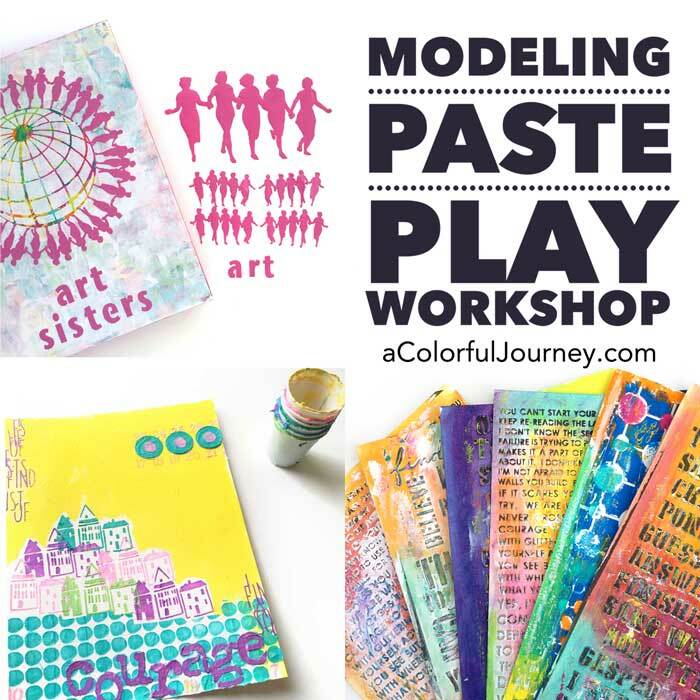 It’s 2014 and time for January’s Colorful Gelli Print Party! 2013 was an amazing year and 2014 will be even better! New to the party? 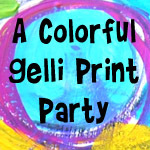 You can see all of the Colorful Gelli Print Parties here. I’m playing with the brayer on the Gelli Plate for the Party this month as I make a modern print. In the video I tell you what I see in these shapes. I’d love to know what you see in the prints – let me know in the comments! You can watch Using a 6 x6 Gelli Plate to Make Modern Prints on YouTube here. Here’s the scrap paper that I cleaned the brayer off on…it was just scrap paper when I started and now I can’t wait to use it in something – even with the piece cut out of it. Here’s the paper made with multiple pulls. The 6×6 Gelli Plate can make papers any size! This is so quick and easy – just 5 minutes and I have 3 unique papers! 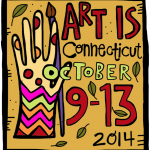 On January 1st, Art Is You registration is live! 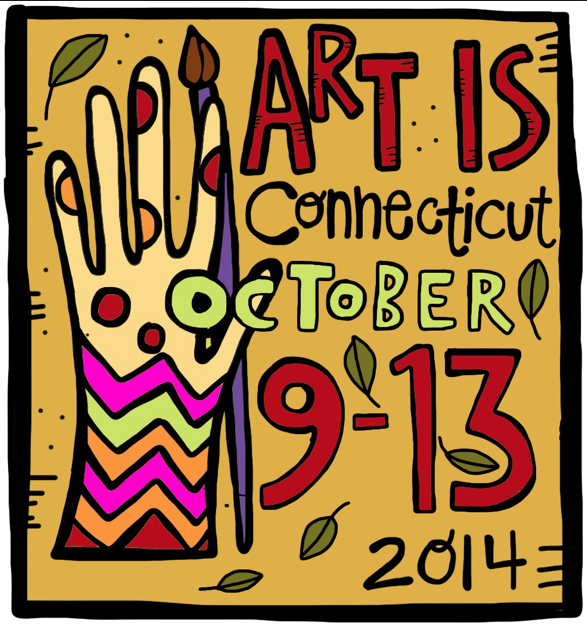 I’ll be teaching at Stamford this year with my workshop, Meet the Crazies. I’ll be back on Sunday with a video about the workshop so be sure to stop back! Now it is your turn to play and inspire others! 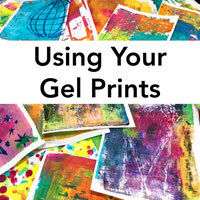 Link up your Gelli Plate blog posts, Flickr photos, YouTube videos , any online media you’re using to share your work– it is all welcome! New posts or recent posts that have not linked up to the party before are welcome! 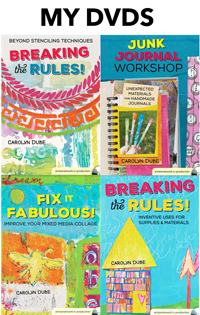 Link to a specific blog post or flickr page or YouTube video or other source that way people can easily find your Gelli goodness. Leave a comment on at least 2 other links from the party. You know how comments encourage creative types! I see….a person eating a cookie and a mouse looking over their shoulder! Happy NEW YEAR my friend!!!! Ooooo, I did this same thing a few months ago and LOVED the prints I got. Posted one for you in the link party. 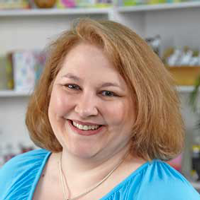 I plan to use some amazon gift cards to get a gelli plate this week! And yes I (happily) blame you. 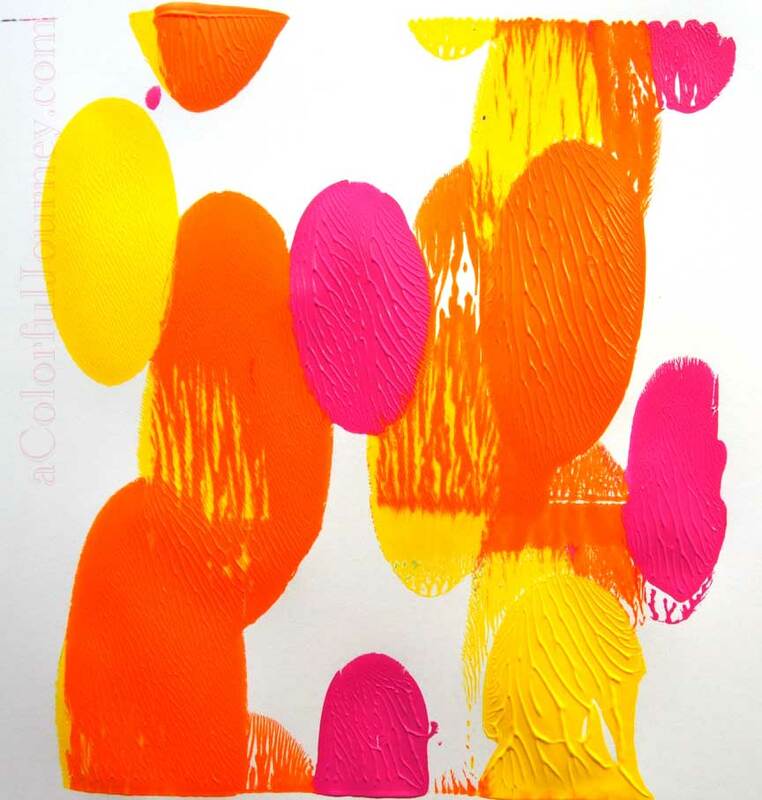 So excited to be home and make more Gelli prints! They are so addictive!!!! I see a bunch of balloons just waiting to be a burst of sunshine!!!! Love it! Seeing some Easter eggs in there too. 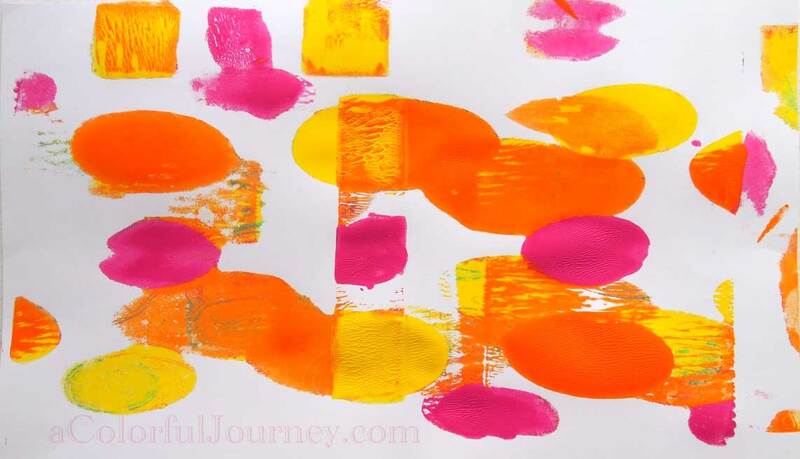 I adore playing with the Gelli plate … and will be sure to return with a little somethin’ to share. And I’m especially lookin’ forward to seeing what others create! In fact, I’m off to take a peek at those already posted! Hi Carolyn, I too saw a creature with large ears and was itching to draw around those gorgeous colour blobs. Thanks for another great video full of inspiration. Glad you liked that post about sealing things with acrylic medium and the Gelli plate 🙂 I’ve expanded it a bit and shown more samples so linked the new post as well. I am LOVING this extra use for the plate. I also show cleaning the plate (and I mean REALLY deep cleaning it) with baby oil. I find it seriously works out any deeply embedded colour and actually improves with performance. I have a bad habit of playing then leaving the plate sitting on my desk uncleaned and uncovered. The oil seems to restore the pullability of the card or paper somehow. Might be interesting to try t and see how much it cleans out from a “clean” plate 🙂 I am sure I saw on some Gelli Arts place or another that you can oil it with mineral oil but for me (and I’m no chemist! follow my lead at your own risk :)) it works a treat. I’ve been doing it now for MONTHS and it has been great. Thanks for all the inspiration at the party! 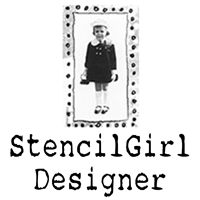 Hi, my name is Kristi, I’m 22 and I shared a link to my facebook of a gelli print that I made using a stencil that I made with my Silhouette cameo from an original drawing. https://www.facebook.com/photo.php?fbid=10152144791354444&set=a.10152139544474444.1073741834.614364443&type=3&theater This is my first time participating in the Gelli print party and everybodys prints and projects all look so good! So glad you jumped in and played Kristi! Thanks for the fun video! 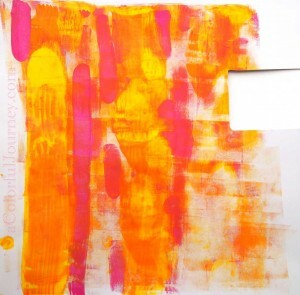 Just bought a gelli plate and can’t wait to use it. Does look very addictive. same paper!!!! (and lots of it too). What I see in the print are lots of spring flower petals scattered all over. I see colourful cacti in the desert! Fun! 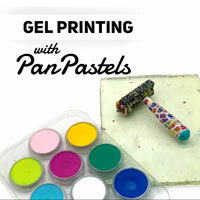 I just got a gelli plate so I’m looking forward to participating in the gelli parties each month. It looks like my color palate is a bit darker than most. I hope to expand my colors as I get more comfortable with the process.